Animacy Theatre Collective. Morgan Johnson and Alexandra Simpson. Animacy Theatre Collective (ATC) is focussed on the creation of original, experimental and interdisciplinary theatre works. We tell stories that: are driven by women, use humor and physical storytelling to raise social awareness, and create characters who defy pre-existing borders (human, nonhuman, gender, sexuality). 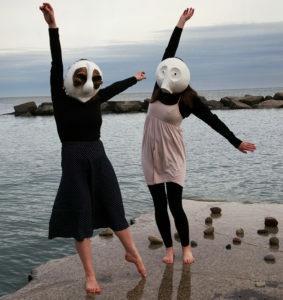 Our work focuses on physical theatre (mask [building and performance], clown, dance and improvisation), playwriting and multimedia to create research-based and devised plays. By collaborating with communities, artists, and grassroots activism we work to converge the artistic, social and environmental spheres, and to challenge interlocking structures of oppression in order to work towards social and environmental justice. ATC is interested in theatre that offers immersive spaces and views all things within them (humans, more-than-humans, places, objects, technologies and all their histories) as theatrical ecologies. ATC was formed through a shared belief in the necessity – especially in the current political climate – of bringing research into conversation with communities through stories that are funny, physical and imaginative. While performance is by no means a uniquely human activity, the history of Western theatre has largely focussed on human subjects, regulating all others to metaphors, props, or atmosphere. In doing so, theatre reifies a division between the human and the ‘non-human’ worlds. How can we use performance to challenge this divide? How might these explorations influence the performances of our day-to-day lives? While recognizing the limits on our ability to understand more-than-human perspectives (or even to an extent other human perspectives), our collective was formed from a shared desire to create art that looks at the agency, animacy, and unique perceptual worldviews of all things.